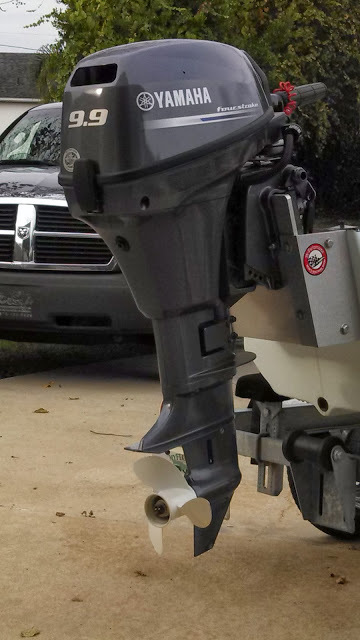 Yamaha Outboard Motors are the Best Marine Motor! I currently run a 2013 9.9 Yamaha 4 stroke engine on my 15′ 4″ Gheeno (NMZ) boat. This engine is great on gas! I have a 3 gallon gas tank and I use about a half gallon of gas when I go out and do an all day fishing trip. When I say an all day fishing trip I mean going over to the Intra Coastal here in Florida, running about 7 miles or so, trolling with my trolling motor for several hours, then running 7 miles or so back to the dock. The Yamaha 9.9 will push my Gheeno around 22 MPH with me in it, a couple coolers, a trolling motor and a battery. Total weight with gear including the boat this motor is pushing is about 500lbs. I love the Yamaha 4 Stroke Engines because you don’t have to worry about the oil mixture like you do with a 2 stroke engine. I use Marine Stabil to keep my gas lines from dry rotting. The ethenol in gasoline now a days dry rots gas lines and creates moisture build up in your motor if it sits a while. I go out fishing on average at least once a week so moisture isn’t an issue for me. All in all this engine is great. It’s cheap to run and super reliable. I plan on getting another Yamaha engine for my next boat which will be a flats boat with a Yamaha 150 on the back. Hope to talk about that motor in the near future! Thanks for reading! Enjoy the beer safely while you boat! Posted on June 11, 2015, in My Boat and tagged 4-stroke, marine, motor, Yamaha. Bookmark the permalink. Leave a comment.